Editor’s Note: For the remainder of June we will be counting down our 10 favorite columns as we celebrate summer vacation. Coming in at number 6 on our countdown is a column from February 11, 2013. This year marks the 50th anniversary of Ian Fleming’s master spy James Bond’s debut on the silver screen. As part of the celebration there have been countless ceremonies and other specials to commemorate the event. From Daniel Craig “parachuting” into the London Olympic Games with the Queen, to the planned tribute later this month at the Academy Awards, it is hard to argue that this is the year of Bond, James Bond. With all of these activities and the DVD release of Skyfall tomorrow it seemed like a perfect time to focus on 007. 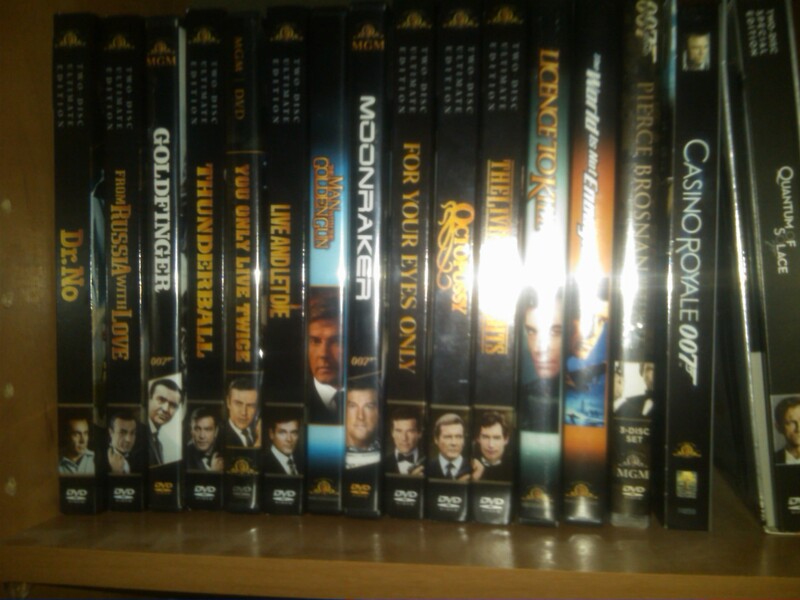 Some of the 23 James Bond movies. Now, it would be easy to try and rank the men who have played James Bond on film. From Sean Connery to Daniel Craig, and everyone in between, most people when asked have a favorite. One common theory of Bond relativity is that a person’s favorite portrayal tends to coincide with whoever was Bond the first time that they watched. For me, my first exposure to Bond occurred during the Roger Moore era. 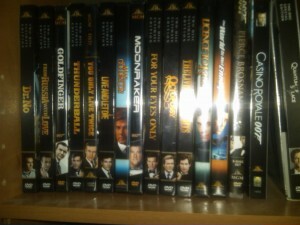 Looking back now the Roger Moore movies were some of the campiest in the franchise. That is in no way speaking ill of them and in fact Sir Roger Moore himself as stated that he was in on the joke and wanted to play Bond in a campy manner with a wink and a nod to the audience. In many ways Sean Connery and Daniel Craig portray a Bond that is truer to the source material than the Roger Moore installment. Don’t get me wrong I enjoy Connery’s and Craig’s portrayals, but for whatever reason I still tend to picture Bond as Roger Moore. I do not hold the same affinity for Pierce Brosnan and Timothy Dalton. I enjoy other films that Brosnan and Dalton are in but just do not care for them as Bond. Timothy Dalton seemed to be trying too hard and Pierce Brosnan seemed like he wasn’t trying hard enough during their stints in the tuxedo. The final of the six men to play Bond, George Lazenby, gets an incomplete grade. I thought that his turn as Bond was pleasant enough but it is hard to say with only one movie to go by. After the list of favorite Bond actor is decided the next logical step that fans are likely to take is picking their favorite Bond girl. In the early films one knew that there would be two Bond girls; the one that was the first to fall into the arms of Bond and the second more complex one. The second Bond girl could be a baddy that was turned good by the power of Bond persuasion or someone else that we were led to believe won the heart of of James and would be seen in some sort of embrace as the credits rolled. So, debate amongst yourselves and pick your favorite Bond girl. For me, that title goes to Vesper Lynd, played by Eva Green in 2006’s Casino Royale. One could also set up a list of best cars, gadgets, or villains. There really is no end to the amount of debate that one can give to the subject. This is one of the many reasons for the lasting appeal of James Bond. But for our purposes let us focus on the beaches of Bond. The mood for the appeal of the sea and the role exotic locations would play in the franchise was set early on in 1962’s Dr. No. Ask anyone who has seen the movie and odds are they will recall Ursula Andress emerging from the ocean in her white bikini with a dagger strapped to her hip as the waves rushed onto the shore. So pivotal was that moment in the franchise years later the producers tried to recreate it with Halle Berry in Die Another Day. And since this is a new era for Bond the fans were given the chance to see Daniel Craig emerge from the surf in much the same way in Casino Royale. Part of the recurrence of beaches in Bond movies goes back to the source material and Ian Fleming himself. 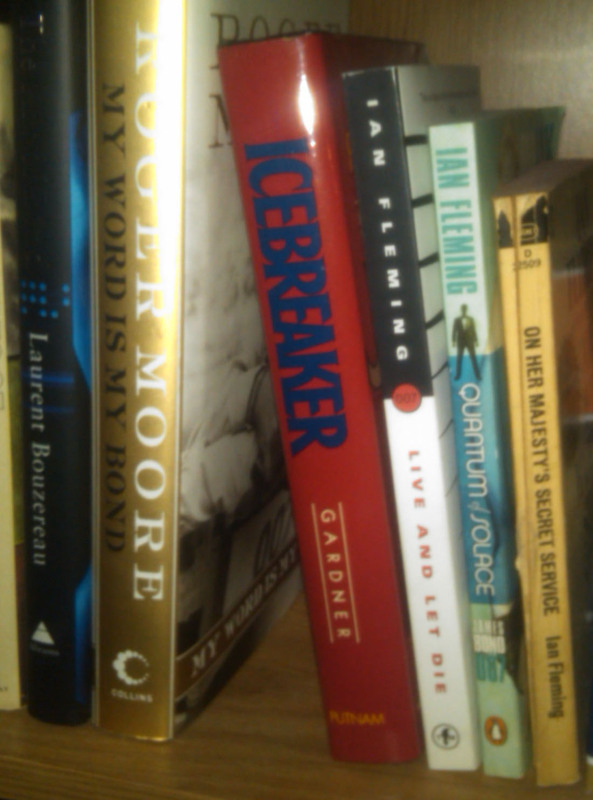 When Fleming was writing the novels that would inspire the film franchise he had a vacation home called Goldeneye in Jamaica. This proximity to the tropical environment came through as three of Fleming’s thirteen James Bond novels, “Live and Let Die”, “Doctor No” and “The Man with the Golden Gun” have Jamaican settings. 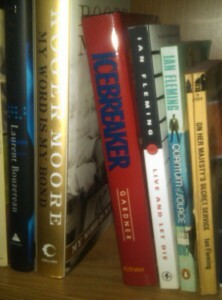 Some of Ian Fleming’s books. Other beaches would follow in the films after Dr. No‘s Jamaican holiday. In no particular order are several memorable beaches of bond. Khao Phing Kan, Thailand in The Man With the Golden Gun, Holywell Bay, Cornwall, England, in Die Another Day, Praia do Guincho, near Cascais, Portugal, from On Her Majesty’s Secret Service, and One and Only Ocean Club, Bahamas from Casino Royale. While the movies allowed the viewer to see the beaches the books allowed one to picture the beaches in their mind as they read along. Arguments can be made either way regarding which is better as the debate over books versus films has raged on for decades if not longer. For me I tend to prefer picturing things in my mind first and seeing them second. But few can argue that the beaches of the films are truly spectacular and add to the visual story that is trying to be told. And back to that first beach from Dr. No; you know the one that started it all. It has of course been renamed James Bond Beach. No word on whether the sand is best shaken or stirred when it gets stuck in one’s swim trunks. Now if you’ll excuse me I think it is time to update the passport and fly out to see some of these beaches in person.